"It's taken years of research and single-minded devotion tracking this painting down through the centuries. It's required nothing less than a lifetime. Not a lifetime. A life. Mine, actually." If judged by its title alone, Brush With Fate could be easily mistaken for one of those woman-in-jeopardy movies on the USA cable network starring Lindsey Wagner or Jane Seymour or some other marginally talented actress who specializes in looking frightened and vulnerable. You'd never guess that it's a fairly literate adaptation of Girl in Hyacinth Blue, Susan Vreeland's critically acclaimed, best-selling novel, and produced by the folks at Hallmark. And though this made-for-TV film features superior production values and an intriguing mystery, it fails to capture the viewer's imagination and provoke its intended emotional response. Yet more compelling than the mystery depicted in the film is the mystery of why the title was changed in the first place. Even though Girl in Hyacinth Blue might sound overtly feminine or juvenile, it's surely better than the trite and melodramatic Brush With Fate, which may alienate and deceive some of the novel's fans. And while a film should never be held hostage by its title, it's tough not to view this drama in a more trivial light because of it. Moniker aside, it's quickly evident that Brush With Fate possesses all the hallmarks of a Hallmark project�serious subject matter, fine actors, and unwavering attention to detail. Largely shot on location in The Netherlands, this handsome production was reportedly the most ambitious and expensive undertaking in Hallmark's 52-year history, requiring hundreds of extras and intricate special effects. But in telling this story about art, it seems the filmmakers became preoccupied with creating art, rather than letting it evolve naturally from the material. As a result, Brush With Fate often feels precious and self-conscious. An air of pretension hovers over every scene, souring our enthusiasm for the story and testing our patience with the film. The drama begins with the arrival of Richard (Thomas Gibson), a new art instructor at an exclusive New England prep school. One day, Cornelia (Glenn Close), the eccentric, reclusive European history teacher, invites him to her home to view what she believes is an undocumented painting by the great Dutch master, Johannes Vermeer. Richard is dazzled by the work's beauty, but questions its authenticity. Cornelia then reveals how she's painstakingly, almost maniacally traced the painting's journey as it changed hands across generations and centuries, all the way back to Vermeer himself. A series of flashbacks illustrates her research, beginning in 1880 and going backward to 1670, the date of the artwork's creation. As we witness the various characters interpreting the painting's enigmatic image, and learn the reasons why they either sell or relinquish what many know to be a valuable commodity, our appreciation for it grows, and we see how art, as it travels through the ages, really does take on a life of its own. The premise is fascinating and the reverse storytelling adds suspense, but the slow, methodical execution often stymies the drama. The actors lumber around with morose expressions and utter Richard Russo's mediocre dialogue as if it were pure poetry. Only Glenn Close gets a chance to chew some scenery, and her ravenous appetite is all-too-apparent. Rarely in a drama has Close so brazenly overacted, and though her wacko interpretation of Cornelia rivets our attention, its cartoonish nature does not escape notice. Ellen Burstyn fares better, despite a questionable accent, as an 18th-century society matron concerned over her son's dalliance with a servant girl. 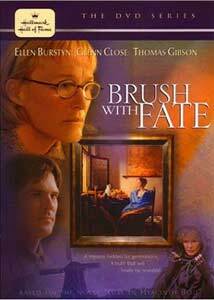 As a Hallmark Hall of Fame production, the unfortunately titled Brush With Fate meets expectations. But for a film with so much promise and one on which so much care was lavished, such a standard grade is tantamount to failure. Girl in Hyacinth Blue deserves better than what is sadly a typical TV treatment. Image Transfer Review: Brush With Fate is presented in its original full-screen ratio and possesses lovely richness and depth, appropriately honoring the painting in the film. The clean source material enhances the transfer's striking contrast and solid colors, and no digital tinkering seems in evidence. For such a recent film, an above average transfer is expected, and Artisan delivers a first-class effort. Audio Transfer Review: There's nothing special about the Dolby Surround mix, but the audio is always clear and dialogue is easily comprehendible. The fidelity increases and envelopes slightly during a dramatic flood scene, but the soundtrack never rises above average status. Extras Review: All text-based, the extras offer a credits listing, cast and crew biographies, and a cursory look at the film's production. Brush With Fate won't disappoint fans of the Hallmark Hall of Fame series, but it won't bowl them over either. Despite the talents of Glenn Close and Ellen Burstyn, this beautifully photographed study of art's impact on man and vice versa never involves us as much as it should, nor reaches the lofty heights its producers envisioned. Admirers of the book might enjoy a rental, but others should consider brushing-off this average film.